Anti-oxidant cream is a supportive balm that frees accumulated particles on the human skin. Normal make-up, through their character (oily, powder or water based substrates), accumulate microscopically every second of the day free radicals from polluted environments. Free radicals harmful to the skin comes from production areas, dust, factories, petro chemical production and burned fuel particles from highways, nicotine, etc. Those particles accumulate on a daily basis in various concentrations in oils and other make-up substrates applied onto the skin. In effect, what is to believe feeds and protects the skin, assist with the contamination of the skin and in effect, helps with the aging of the skin. 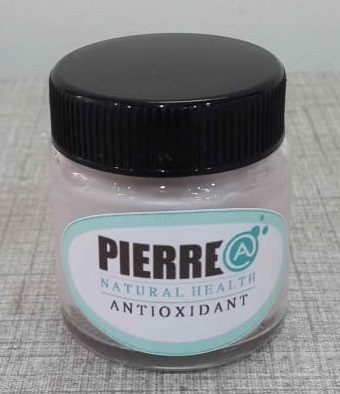 Pierre@ D anti-oxidant balm, through its unique structure of skin healing oils and bioflavonoids, proanthocyanidins (Proanthocyanidins are present in the fruits, bark, leaves and seeds of many plants where they provide protection against predation), cleanse, ease and prepare skin cells, able them to repair with the Pierre@ D Colostrum balm healing abilities to enable cell DNA and skin telomere growth to ensure healthy skin growth and aging repair. Velsorg: Pierre@ Natural Health Antioksidant room. Ouer velle het meer tyd nodig totat die telomere in die DNA gevestig het en herstel het om verjonging en elastisisteit mee te bring. en smeer dan die Colostrum Balm aan. Some can absorb in 5 min because the skin is capable and healthy enough. Older skins need more time until the telomeres have established and repaired the DNA to bring rejuvenation and elasticity. and apply the Colostrum Balm.